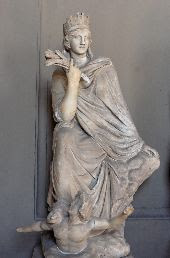 The Tyche of Antioch was one of the most famous cultural exports of the ancient city. Other cities created their own Tyches but Antioch's remained the most famous. The goddess was worshipped in the form of a statue, the best extant version of which is in the Vatican Museum (see below). This is a Roman copy after a Greek bronze original of the 1st century BC. The original is attributed to Eutychides of Sicyon in Achaea, a Greek sculptor of the latter part of the 4th century BC, who was a pupil of Lysippus. The official image of the goddess most definitely stood in a temple structure. It had a tetrastyle format, somewhat like a baldachin. Most versions show two pairs of columns at each corner and a shallow arch framing the statue. There is almost always a form of urn on the roof and a flying ram above. Though the ram is not part of the structure. On the best specimen we have seen, the columns appear to have Corinthian capitals. This is the only building (leaving aside the walls and gates) that we know of for which images of the time exist. And there is no shortage of representations of the structure as it was repeated innumerable times on the city's coins. So many of these exist, and they generally appear the same, that it seems likely that conjecture is not required in this sole case, and that what you see is what you would have got, visiting Antioch in the first few centuries of Roman rule in Antioch. 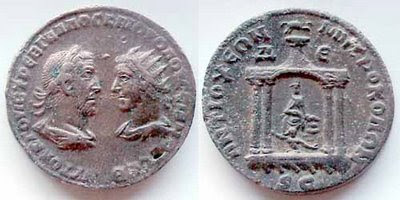 This is a coin of Trebonnius Gallus (and Volusian). 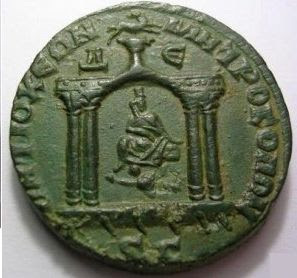 For some unknown reason the coins of this rather obscure emperor (he reigned 251-53 AD) are those that predominate in using the Tychaeum image. The exact site of this shrine is unidentified but we have seen suggestions that it stood very near to the riverbank.